Western blot analysis of whole cell lysates probed with TRF1 antibody (VMA00032) followed by detection with HRP conjugated Goat anti Mouse IgG (1/10,000, STAR207P) and visualized on the ChemiDoc MP with 9 second exposure. Arrow points to cytokeratin 8 (molecular weight 60 kDa). TRF1 antibody recognizes telomeric repeat-binding factor 1, also known as NIMA-interacting protein 2, TTAGGG repeat-binding factor 1 or telomeric protein Pin2/TRF1. The antibody has been extensively validated for western blotting using whole cell lysates. 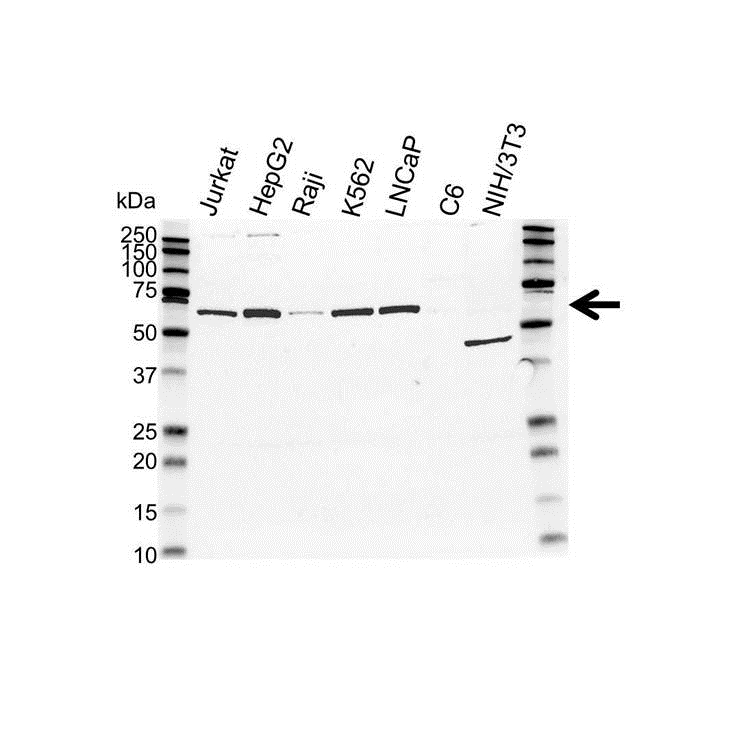 Mouse anti Human TRF1 antibody recognizes human telomeric repeat-binding factor 1, also known as TTAGGG repeat binding factor 1 (TRF1) or NIMA-interacting protein 2. TRF1 is a ubiquitously expressed 439 amino acid DNA binding protein and negative regulator of telomere length containing a single Myb domain. Along with tankyrase-1, TIN2, and PINX1, TRF1 binds the double-stranded TTAGGG repeat of telomeres and regulates telomere length. Protection of telomeres-1 (POT1) is a single-stranded telomeric DNA-binding protein which controls the elongation of telomeres by telomerase. TRF1 mediates the loading of POT1 onto single stranded DNA, conveying information about telomere length to the telomere terminus, where telomerase is regulated. If the telomere is long enough, telomerase is inhibited. Additionally, in conjunction with POT1 and TTAGGG repeat binding factor 2 (TRF2), TRF1 recruits factors to the telomere, inducing the formation of the protective t-loop. TRF1 along with TRF2, POT1, TIN2, TPP1 and Rap1 form the shelterin complex which distinguishes telomeres from sites of DNA damage (Wellinger 2009). TRF1 is thought to play a role in leukaemia (Shi et al. 2006). Mouse anti Human TRF1 antibody recognizes human TRF1 as a single band of ~60 kDa in multiple human cell line lysates by western blotting under reducing conditions. Anti TRF1 antibody detects a band of approximately 60 kDa in K562 cell lysates.